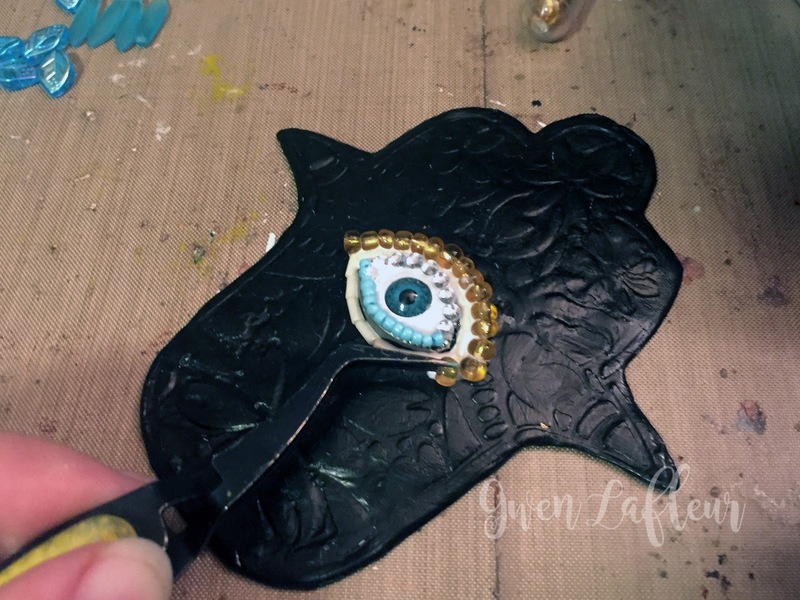 Hi everyone, it's Gwen back again today with an installment of Gwen's Gems! This month I decided to try another project based on my inspiration files... I've had this on my "to try" list for a while. 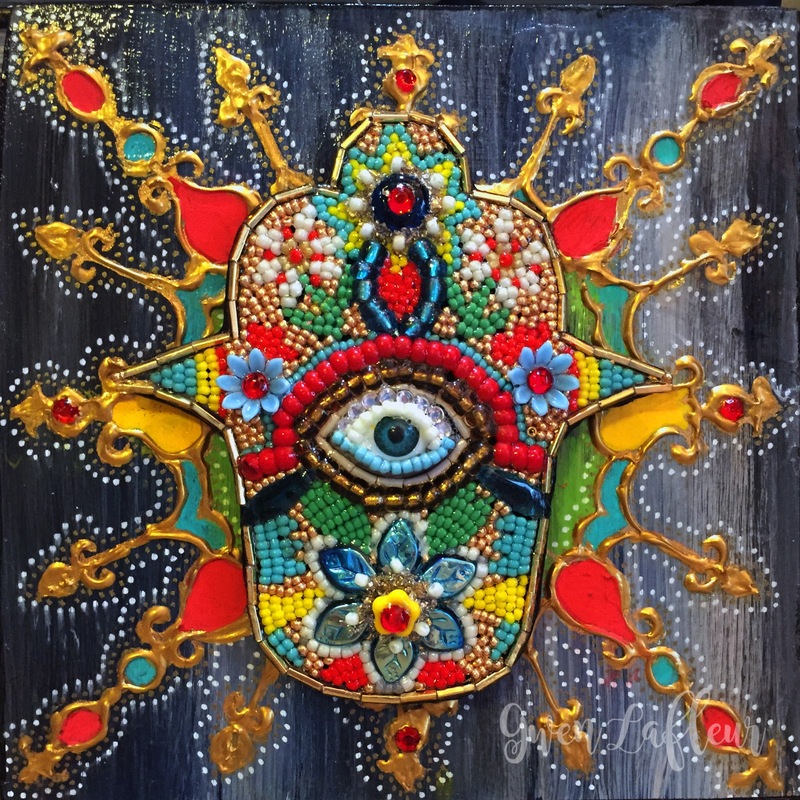 I'm a HUGE fan of the work of Betsy Youngquist * and I've long wanted to see if I could make my own beaded mosaics. So that's what I did! I have absolutely zero training as a mosaic artist, but from what I've read you generally start by laying out a pattern on your substrate that you'll fill in with the tesserae, or in this case, beads. What better place to start than with a stencil? I took the Five Hamsas Stencil by Jessica Sporn and picked one that I thought would be fun as a beaded design and stenciled it onto a piece of chipboard. 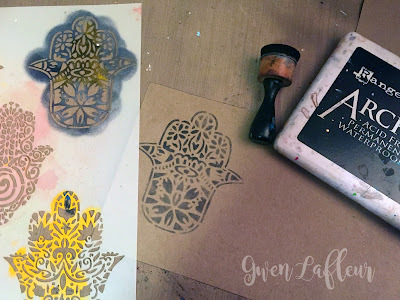 ...then I got back to following the pattern from the stencil. 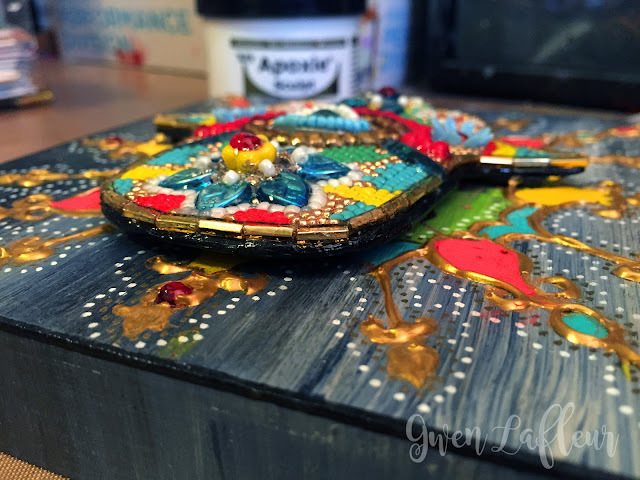 Since I wasn't pressing them into uncured clay, I decided to use glue. 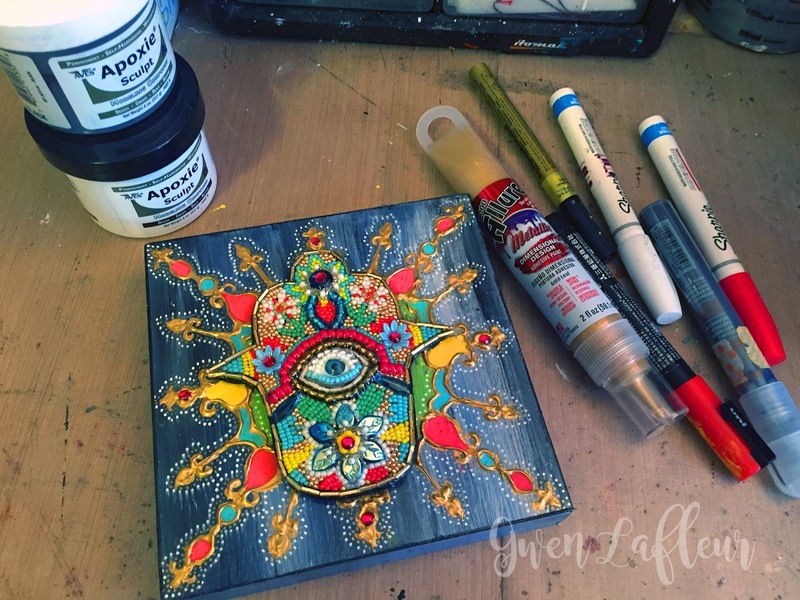 I had some PVA glue in a fine liner bottle which I loved for this because it gave me the ability to do detail work while still using a fairly strong glue of my choice. 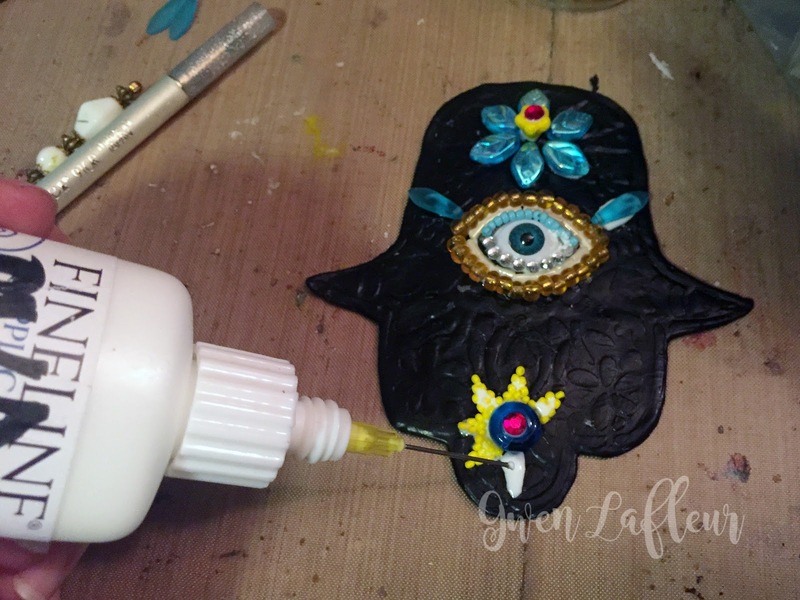 Here you can see how I outlined a small area with the glue, then placed the beads. 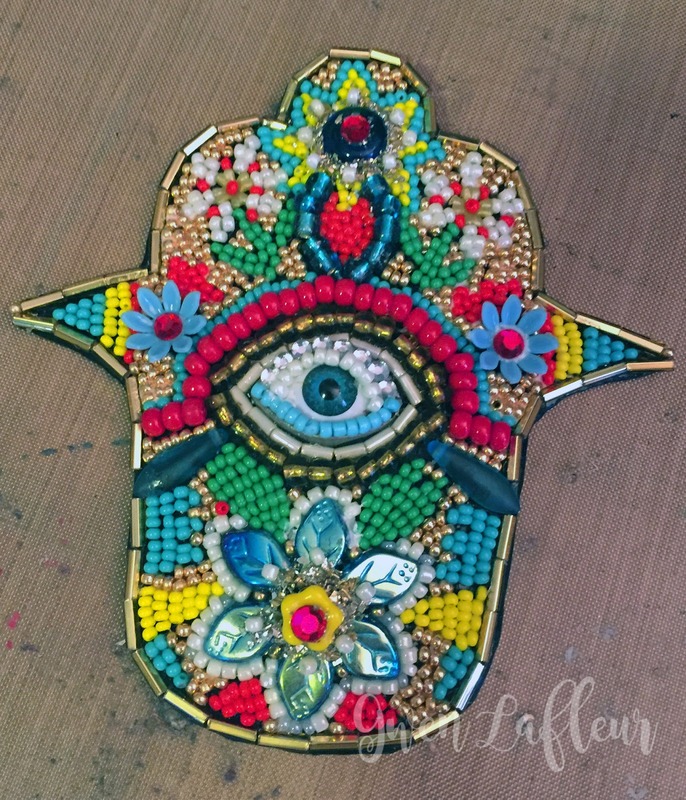 I tried a few different methods for placing beads during the course of the project... by the end I was just using a hatpin and that was what was working best. Here you can see a few in-progress shots as I worked through all of the sections. Is this a long and tedious process? Yes! (But I think I can say that about many of the things I work on. LOL.) 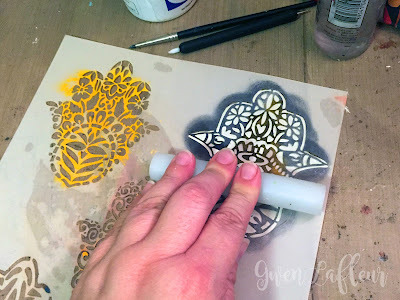 This is something that's good to work on while you're waiting for paint to dry on something else because it's easy to just do a small section and then set it aside. I think that helps keep the tedium from getting too overwhelming. Finally, all of my beads were in place. While PVA is quite a good glue, I don't really trust it to hold all of that hard work in place long term. So at this point, I put some polymer medium in a bottle with a fairly small opening (this gave me more control in applying it) and put a thin coat over top of the entire piece. 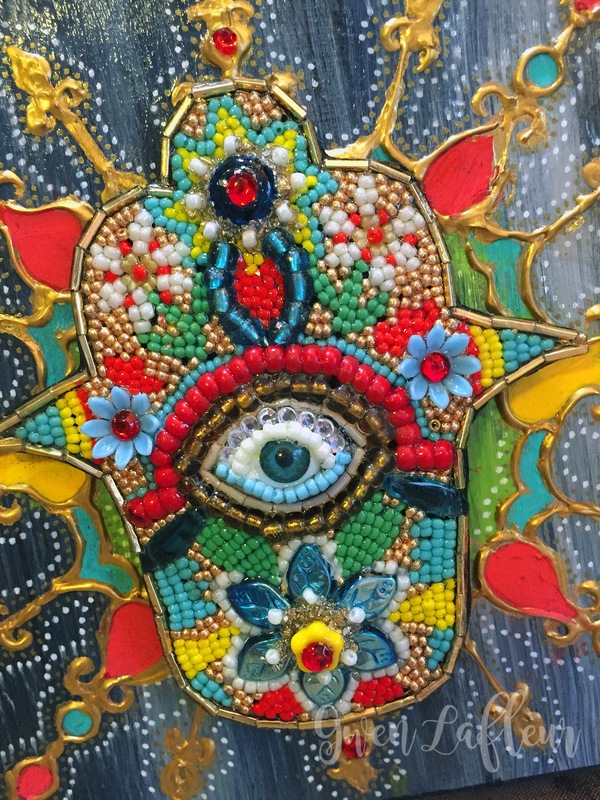 The polymer filters down in between the beads so that when it dries, everything is locked in place and you have a nice shine, but the texture of the beads is still very clear. 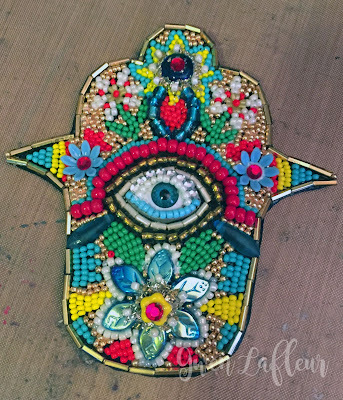 You could turn this into a pendant for a very flashy statement necklace, make it into a piece of home decor... whatever you want! I decided to mount it on a birch panel so I could hang it on the wall. Before doing that, I created the background. 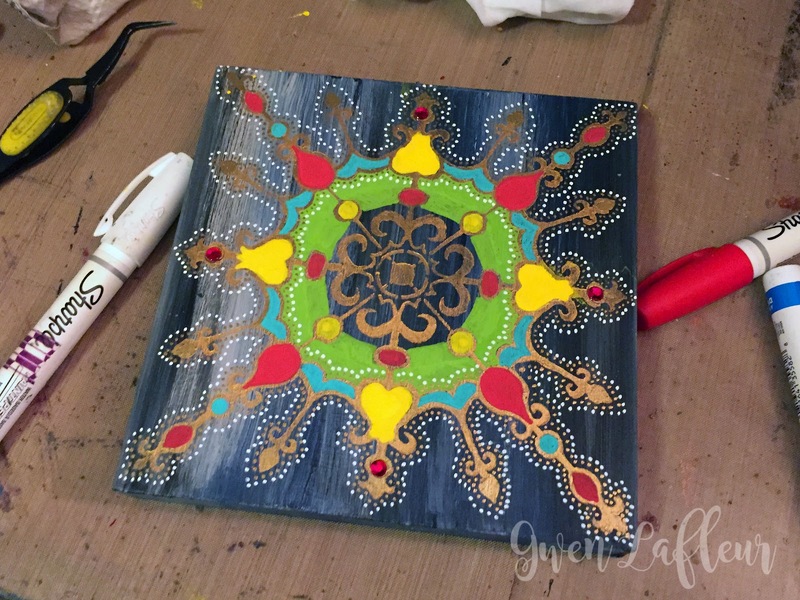 I used a 6x6 birch cradled panel (7/8" deep) and gesso'd and painted it. 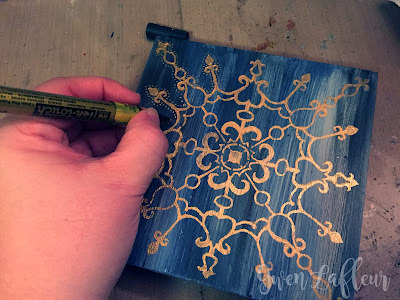 Then I used my Decorative Filigree Ornament stencil and some gold paint to put the main image down. Naturally, I followed that up with some gold dots all along the outside of the design. You could leave it plain, but I wanted lots of color matching the colors of my beaded piece so I used coordinating paint markers to color in the sections of the stencil design, plus white to add some more dots. Whew! Almost there! I decided that this just wasn't enough, so I got some gold dimensional paint and went over my gold lines. It was one of those... am I going to ruin this? moments, but I loved it! 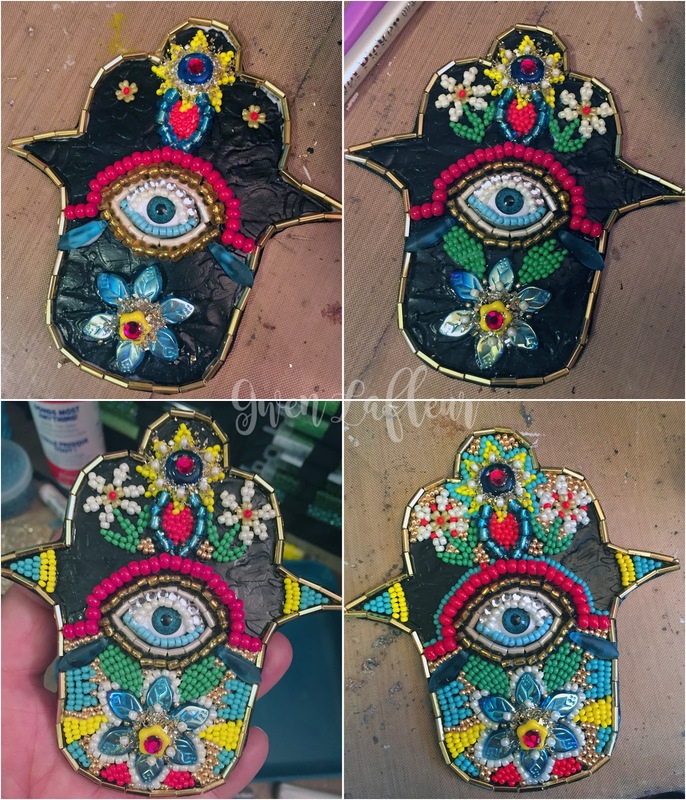 Then I took some black Apoxy Sculpt (I got smart this time) and put some on the back of my hamsa so that I could mount it to the panel and have it lifted up a bit for more dimension. Voila! Finished! (Although... don't you think it needs some gold trim around the sides? 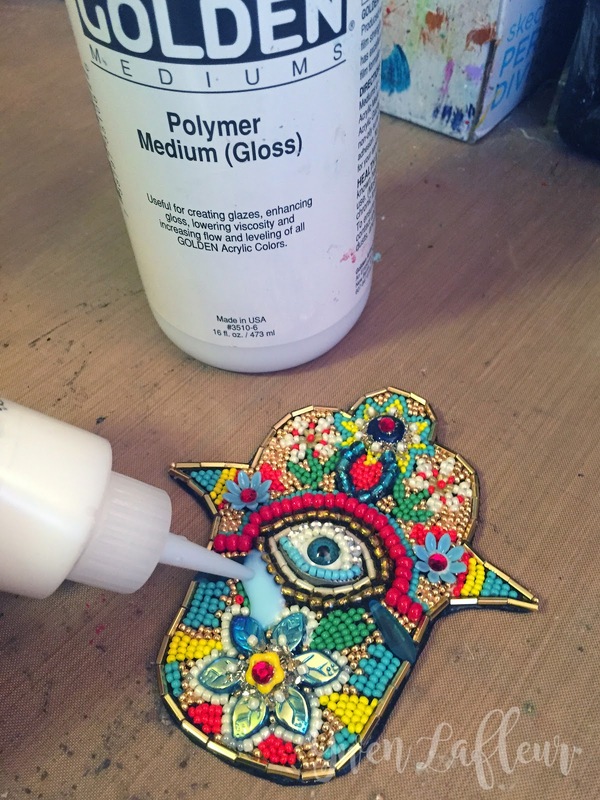 Hmm...) I LOVE how this turned out, and I can guarantee you that I'll be doing more beaded mosaics in the future!